Admission: The garden used to charge an admission fee, but no longer does so. Call 713.845.1003 for information on organizing events. 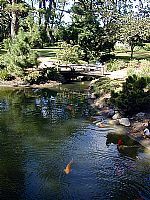 JGarden Description: The Japanese Garden in Hermann Park is operated by the City of Houston, Parks and Recreation Department and was created by the efforts of American and Japanese businesses with grants from many foundations and individuals. The City of Houston donated the land and helped with the construction. It is a symbol of friendship between this country and Japan. This particular garden is a daimyo style, and includes a tea garden, a kaiyushiki stroll garden, and a scroll garden. The entry garden is a dry landscape garden. Imagine you are standing on the sea (black moonstone) and the boulders are the rising landscape of Japan. The bamboo flowing in the wind represents the sound of the ocean. The boulders were moved from a former Japanese garden at the downtown Houston Lighting & Power building downtown. Entrance to the garden is through the gatehouse or nagayamon. A gatehouse at one time was used for living quarters or storage, but here it is used for other purposes, - ticket booth utility room and rest rooms. Through the gate straight ahead there is a welcoming lantern, a gift from the city of Chiba, Japan. This five-piece lantern was carved from solid granite. The aperture of the lantern focuses the spirit of the garden. There are three stone lanterns, ishi-doro, in this garden. Curved pathways in the garden are covered with crushed stone similar to moonstone. The arbor is a place to sit, meditate and clear the mind of other thoughts. It is also special place to wait until called to tea ceremony in the teahouse. Across the pond, one can see the yukimi lantern given by Houston's sister city - Chiba. Imagine that it is a lighthouse placed on a stone beach, with the pond as an ocean and the rocks in the water symbolizing ships being guided by the lantern. The cascade or waterfall makes one think of melting snow from a mountain stream. The hill is landscaped in cherry-blossom-pink crape myrtles, which bloom in the summer. Crape myrtle trees, which originated in China and Japan, are common in Houston. The stones are of Texas pink granite from Marble Falls near Austin. Leaving the arbor, proceed to the right along the flat stones through the tea garden gate or niwakido. Before entering the teahouse, tea ceremony guests walk along this path which the host will have moistened to appear damp with morning dew. This path is hence called the dewy path or roji. The tsukubai, at the end of the dewy path is used to purify oneself before going into the teahouse. This tsukubai arrangement includes the water basin, three flat rocks surrounding it and a bamboo dipper to dip water from the water basin. A beautiful sound is created when water falls through the small stones into the mizukoto or water harp below. Near the teahouse are two viewing stones. When the teahouse is open and one stands on these viewing stones to look through the teahouse, one can see a living picture of the waterfall with the distant pine trees creating a borrowed landscape or shakkei. This living picture resembles a Japanese woodblock print or ukiyoe. It is important to note, the teahouse was placed first and the garden view was then created around it.